zb Media has a large collection of historical films. Our film archive ranges from the beginnings of film around 1900 to the last decade of the 20th century. We research film archives all over the world and have films digitized on 2K. Contact us for licensing. We are looking for archive films from private sources for new projects. If you have archive films, please contact us. During the last half century, banking has undergone a revolution. Technology has transformed the way we obtain financial services. The film about In-touch telephone computing was released in 1973. It shows telephone banking as a new possibility for the ‘near future’. An insight into the history of technology that shows how we humans develop ideas, how we want to act differently in the future and what benefits we expect. In most cases, things will turn out differently. On June 4, 1973, a new home computer service with touch-tone telephones and a voice output system for output was put into operation in Seattle. The service, called In-Touch, is launched by a start-up company, Telephone Computing Service, a subsidiary of Seattle-First National Bank. Retail customers paid $6.50 for various data processing services, including automatic payment of bills by phone, preparation of income tax, and operation as quadruple computers. For the monthly fee, subscribers received 100 minutes of use and paid four cents per minute. The system used all twelve keys of the touch-tone phone. Templates on the buttons instructed subscribers to use the system. Each user had a personal phone-computer connection. There were six main services: Money transfer for bill payment, family budgeting (telephone data collection and weekly mailing), wage tax processing, calendar reminder service, household recording and pocket calculator. After four months of experience with this service, Seattle-First National claimed that the response had been “fantastic” and “several hundred” subscribers had registered since the service was launched in June 1973. But only 2 months later, the president of Telephon Computing Service announced that the company would retire by end of the year 1973. It was stated that a major obstacle was the requirement that customers have touch-tones phones. While business leaders felt that the procedures for operating the computer via the touch-tone phone were simple, they were too complicated for many people. “We were ahead of our time”. It needed another 15 years similar home banking services saw growth during the 1980s and early 1990s. However, online banking started not before the late 1990s to become a widespread service. This film was released in 1973. It shows telephone banking as a new possibility for the near future. Charles Eames and his wife and partner Ray are best known for their chair design or their famous house in Pacific Palisades near Los Angeles. They have shaped the design of the 20th century. It is little known that they have also produced numerous films, including more than fifty films, exhibitions and books for the computer group IBM. With the help of animations, characteristic aspects of the logic of electronic problem solving are presented. 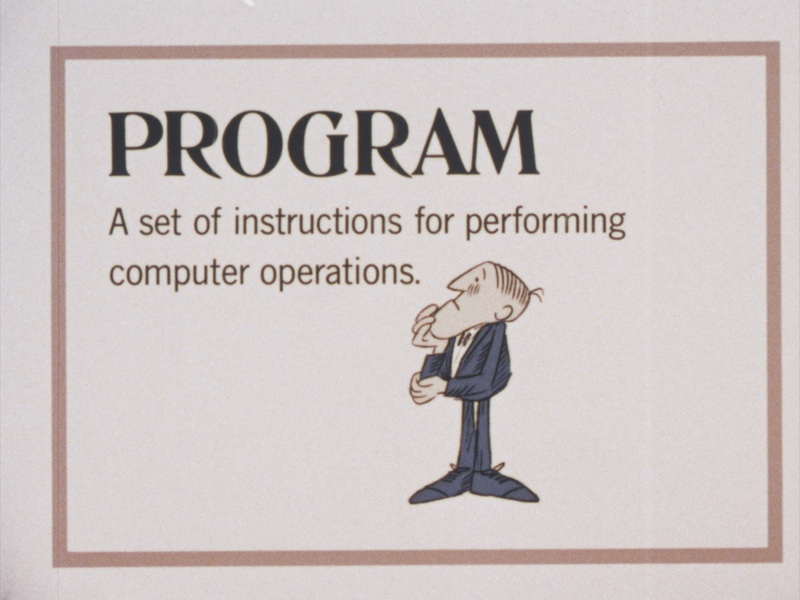 With its two image levels, the film provides an introduction to the functioning of a computer. A process and its cybernetic representation are illustrated by simple means. The film shows an animated sequence of an event on the first image level and the representation of this event in a flowchart on a second image level. Such flowcharts were the usual basis for the creation of computer programs in the 1960s. The diagram uses the then common classical symbols for data flow diagrams. With the help of templates, such processes were initially recorded manually. The careful analysis and exact representation of the sequence of the respective data flow is the decisive prerequisite for the correct creation of the program instructions for controlling the computer. The film was made in 1968 by Glen Fleck, an employee of the office of Ray and Charles Eames, with support from Lynn Stoller of IBM. The film won a bronze medal at the Atlanta International Film Festival in 1969. The film by IBM and the Eames Office was first shown in 1968 at IBM’s Lakeside Pavilion at the Hemisfair World Exhibition in San Antonio, Texas. To learn more about Ray und Charles Eames visit Eames office page. The film from the newsreel Universal News March 1947 shows the departure of Jews to Europe, the arrival of the ship Chaim Arlosoroff (original name Ulua) in Haifa. And the severe bomb attack on the Barclays Bank in Haifa (28.2.1947) and the Goldsmith officers club in Jerusalem (1.3.1947). Finally we see raids by the British military and the arrest of Jews. The political development in Palestine in 1947 was marked by a spiral of violence and reprisals. JERUSALEM, 28 February 1947 (UP) A series of violent explosions shook the port area of Haifa today after a refugee ship carrying 1,350 non-certified immigrants landed off the nearby Palestinian coast. Two Jews were killed and a British soldier and a Transjordan Border Guard man were seriously wounded when explosives destroyed the Barclay’s Bank security zones in the heart of the Haifa port area. A series of three bombs or landmines exploded on the expected arrival of the refugee ship Haim Arlosorov in the port of Haifa. On 1 March 1947, the Jewish Jerusalem Fighting Force bombed the British Officers’ Club in the Goldsmith’s House in Jerusalem, causing 18 deaths and 25 injuries. Jewish terrorists dressed in British uniforms filled the club with machine gun fire and detonated three backpacks of bombs in the entrance of the building, which severely damaged the building. The increasing violence prompted the British government to give up its mandate over Palestine and withdraw its troops a year later. From May 1947, the status of Palestine is negotiated at the UN. On 29 November 1947, Resolution 181 (II) is adopted by the UN General Assembly. The resolution contains a plan for the partition of Palestine. In 1948 the British gave up their mandate and the State of Israel was founded, followed by the War of Independence. The story of a never shown film role Richard Strauss shows in his garden. The visits of Klaus Mann and William Wyler to Garmisch in 1945. The great old master of European classicism and his behaviour in the Nazi empire. For some years I have been looking for film material about German history in the National Archives in College Park. I noticed some material that I didn’t know much about at first. But as always, stories that can be material for an exciting reportage are tied to such shots. The composer Richard Strauss was filmed in his garden in Garmisch at the beginning of June 1945. Back then, in the early summer of 1945, film director William Wyler came to southern Germany with a US Air Force film team. Wyler shot color films for the film Thunderbolt!” in Munich, Berchtesgaden, Dachau and other places. The film was taken during a visit to Richard Strauss in Garmisch-Partenkirchen. A very unusual theme, at least in the context of these Wyler films. This footage was never published because Wyler only finished the first of his two planned films because of the end of the war. In the other preserved film roles, which I reviewed and scanned together with Elisabeth Hartjens in the American National Archives, Wyler’s cameramen mainly film the effects of the bombardments of German cities. So why Richard Strauss? We see Strauss with peonies in the garden of the Strauss Villa at Zoeppritzstraße 42 in Garmisch. Little is known about the meeting of Wyler and Strauss. Strauss reads in the score of the opera “Die Liebe der Danae”, which was written between 1938 and 1940 and was first performed in Salzburg in a public dress rehearsal in the summer of 1944. The world premiere of the opera did not take place until 1952 in Salzburg. What is unusual about the style of the recordings are the numerous close ups by Richard Strauss. There are no portraits of any other personality in the collection of these Wyler films. Garmisch-Partenkirchen had been conquered by the US Army on April 30, 1945. On the day of Hitler’s suicide. A troop of the US Army invaded the Strauss Villa to make quarters in the magnificent house. So the 80-year-old composer faced – in Garmisch snow fell that day – the wet and exhausted GIs. He describes in his memoirs that he had introduced himself as the composer of the Rosenkavalier, whereupon the Americans immediately left. Some of the American soldiers involved, however, describe the encounter somewhat differently. The Strauss family served food to the GIs and Richard Strauss played the piano in the living room. This was not very helpful, the Strauss family actually had to leave the house for a few hours. But the soldiers were instructed to move on immediately towards Innsbruck, so they left the house again. Why the Americans had to continue so suddenly has to do with another exciting story – the fights in the Inn valley for Castle Iter. Anyway, the Strauss family can go back to their house. On the evening of the same 30 April, the musicologist and American lieutenant Alfred Mann also came to the Villa von Strauss – Richard Strauss is well known to him. Alfred Mann is the son of the pianist Edith Weiss-Mann. An emigrated connoisseur of Germany and an admirer of Strauss with influence high up. “When the tall, imposing figure of the eighty-year old man appeared in the door frame, it seemed to me as if a chapter from music history were opening before my eyes”. In any case, the Strauss Villa becomes “off limit” after the arrival of Alfred Mann – the US Army now holds its hand over the house of the famous composer and in May 1945 Richard Strauss is the subject of lively visitor tourism. Alfred Mann has nothing to do with another gentleman who will visit Strauss. This Mann is no less a man than Thomas Mann’s son. Klaus Mann meets Richard Strauss on 15 May, a wonderful summer day, as he writes. Are the recordings from this context? “I thought it wiser not to disclose my identity,” notes Klaus Mann. The day before, he had visited his destroyed parental home in Poschinger Strasse in Munich. The loss of status and existence was painfully experienced. Now, incognito, he visited the stately villa of an artist who had stayed in Nazi Germany. In “Three German Masters” (Strauss, Emil Jannings, Franz Lehar), Klaus Mann attempts to trace the opportunism of those artists who pacted with Hitler. Although they could have easily turned their backs on the regime because of their international fame. The conversation between Klaus Mann and Richard Strauss actually revolves around the “Love of Danae”, which should have been premiered in Salzburg on August 5, 1944 – but the performance was cancelled because of the assassination attempt by Count Stauffenberg. Strauss interprets the dismissal of his play as a “conflict” with the regime – as Klaus Mann ironically notes with quotation marks. At that time the Salzburg Festival had indeed been cancelled – not a single piece by Richard Strauss. Wyler’s film camera doesn’t accidentally go into exactly this piece “The Love of Danae”. The scenes of the raw material are staged throughout, from the peonies (shot twice in the raw material) to the close ups of the quietly singing composer reading the score. Klaus Mann describes his conversation “in front of his stately villa, under the beautiful trees of his large well-kept garden”. And mentions that he had two companions. This is exactly where the camera targets Richard Strauss and does not fail to find a symbol for the magnificent garden beforehand. However, the index card for the film material shown here notes that the “Can 9224-1” was shot in June 1945: “Medium shot small hut in the Bavarian Alps – old man picking flowers in foreground – man in Richard Strauss” and “Date Photo’d: June 1945”. The film material was recorded in June 1945 for further processing in New York. During Klaus Mann’s visit, the footage was certainly not shot. But William Wyler knows Klaus Mann from Hollywood. Mann’s report on his encounter with Richard Strauss appears on 29 May 1945 in the American soldier newspaper “The stars and Stripes” under the title “Strauss still unabashed about ties with the nazis”. One day after the article by Klaus Mann, Wyler and his team travel to Garmisch and shoot the footage with Richard Strauss. What is really going on behind the forehead of this world-famous composer? “The love of Danae” – a piece of cheerful renunciation? The naive egocentric? The opportunist?